Ok, I know this sounds a bit harsh …. But sometimes don’t you just want to scream "Piss Off Pain …. Go Away!" I sure do and to be honest I use worse words than that. Plus it just goes on and on. Last migraine was 6 days and the one before ten days. I struggle to stay happy and positive during these times. 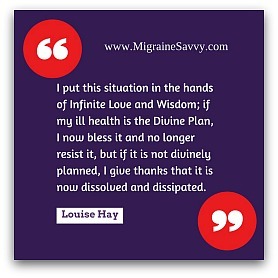 So for this month we are just going to have a little affirmation by the legend Louse Hay. Have you tried using affirmations to help stay positive despite the migraines? Please click here Positive Affirmations to share your answer. I hope you come back and visit us again and again to see what's new. I have one more new natural medication for you to read about in a couple of issues. P.S. If you are feeling down you might like to read my post on Depression Warning Signs or print out the CBT Depression Thought Record Sheet to help you with changing any negative thoughts to realistic and positive ones.